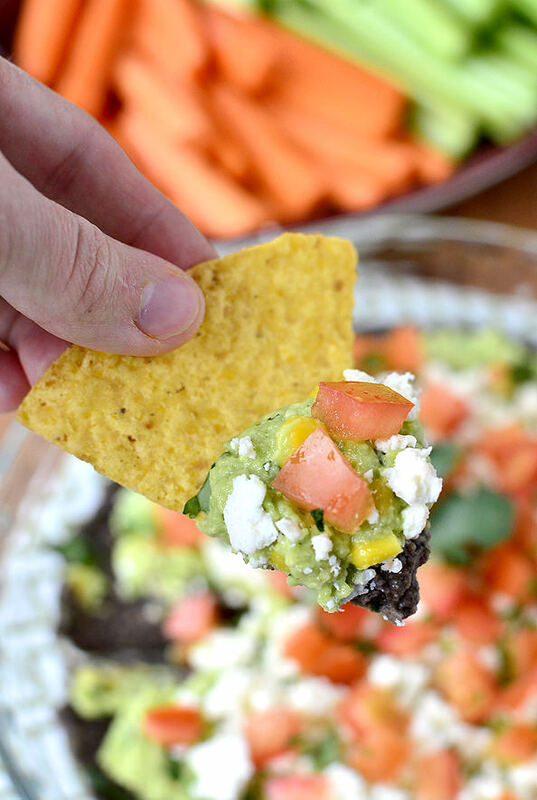 Gluten-free Black Bean and Sweet Corn Guacamole Dip is a fresh and easy appetizer recipe that will be a hit at your next party! Last week I asked my Facebook friends what kind of Super Bowl recipes they were looking for this year. Dips? Bites? Sweet? Savory? There was a resounding request for savory recipes, and even more pleas for dips! dips! dips! Healthier dips, to be exact. 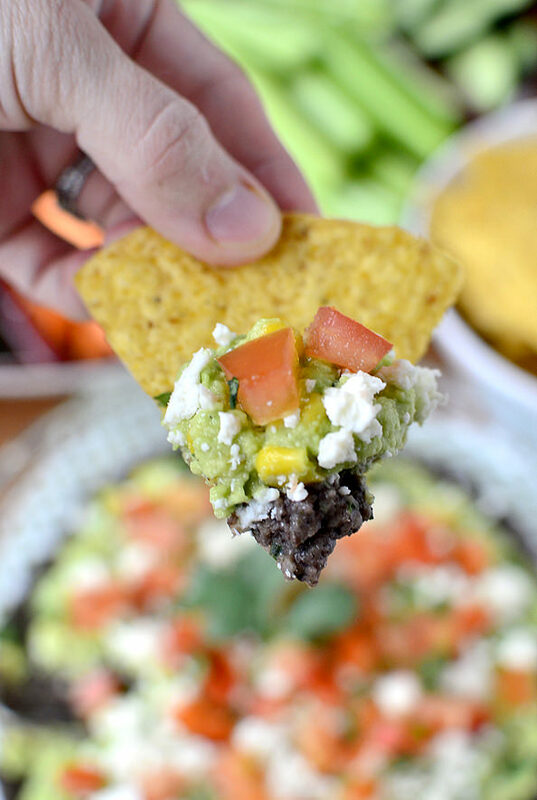 Black Bean and Sweet Corn Guacamole Dip is a healthier dip recipe for the Super Bowl, or any get-together for that matter, that tastes anything but. It is EXPLODING with bold, zesty flavor! 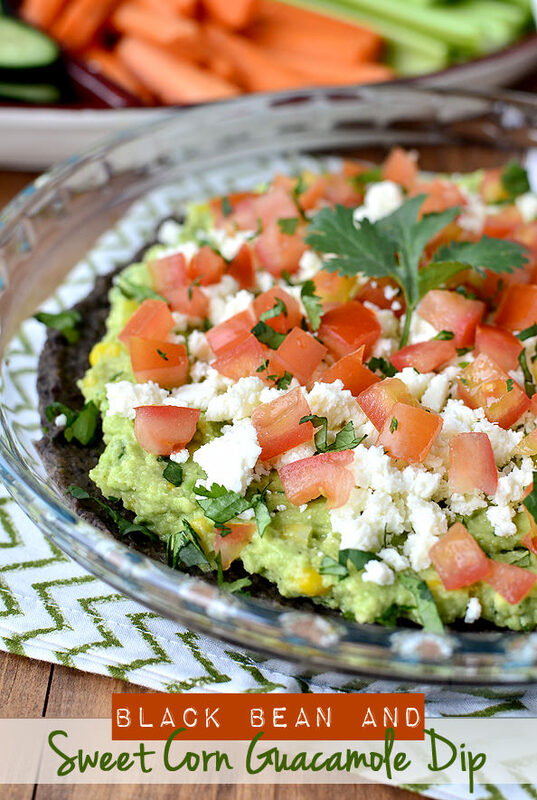 This layered dip starts with a garlicky, 1-minute black bean dip that’s topped with sweet corn studded guacamole, crumbled cotija cheese, and chopped fresh tomato. It is perfection on a tortilla chip. Or cucumber slice, if that’s how you roll. I don’t normally dig, well, digging into layered dips with fresh veggies, but this dish tastes equally as delicious on a crispy chip as it does on a crunchy carrot. 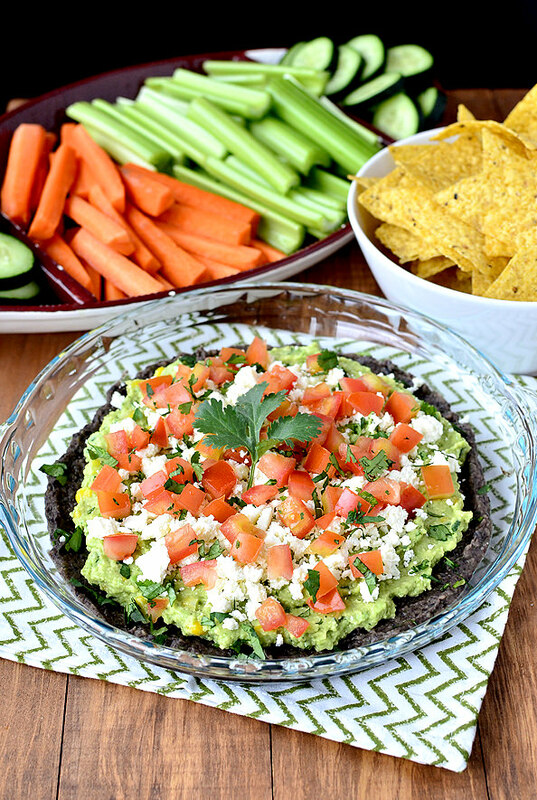 I’m crazy for all the layers in the dip but am particularly partial to the guacamole with sweet corn. Me thinks I will never make guacamole without it again. The sweetness it brings to not only the layer, but the whole dish, is INCREDIBLE – I can’t wait for you to try it! 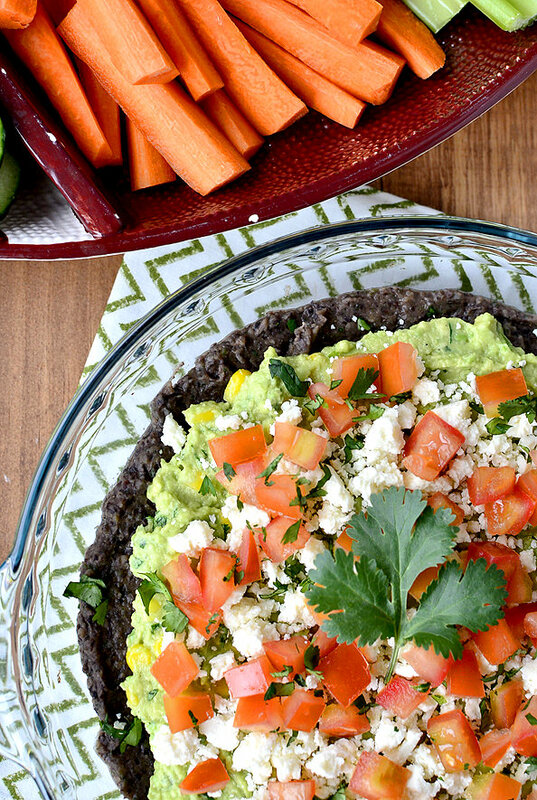 Start by making the super-simple Black Bean Dip layer. If you can add stuff to a bowl – you can make this dip. Toss ingredients including seasoned black beans, jalapeno, cilantro, onion, garlic, cumin, lime juice, salt, and pepper into the bowl of a food processor (might be able to do this in a blender) then let ‘er rip. That’s it! Spread the dip into the bottom of a 9″ pie plate then place it in the refrigerator to chill while you make the next layer. BTW, I used these seasoned black beans. 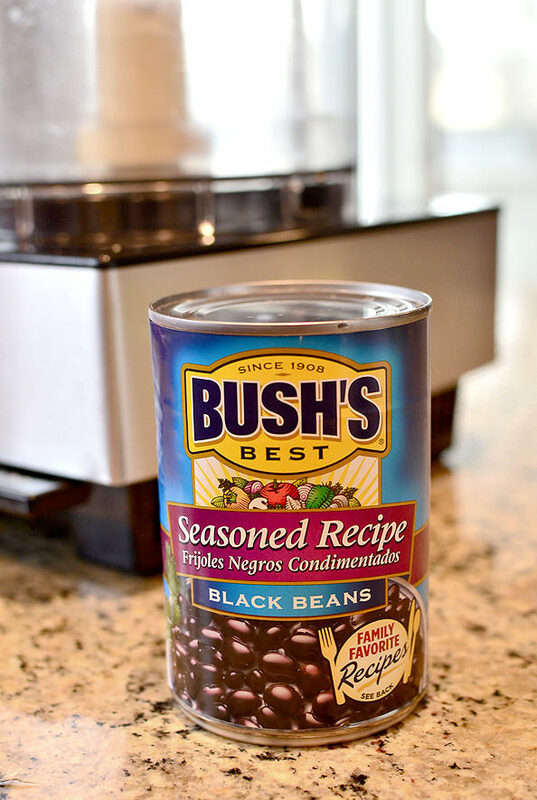 If you can’t find them just use regular black beans – the dip will still be delicious! Next fold in frozen –> thawed sweet corn and chopped cilantro. My favorite brand of frozen sweet corn, for when it’s out of season, is Birds Eye. I’m telling you, this corn is sweeter than candy. 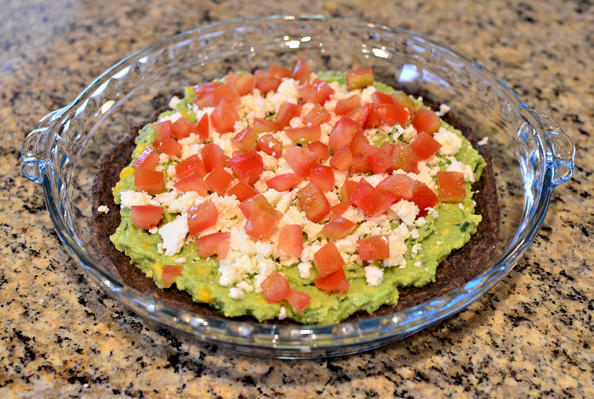 Spread the Sweet Corn Guacamole on top of the Black Bean Dip. Next, crumble some Cotija cheese to go on top. 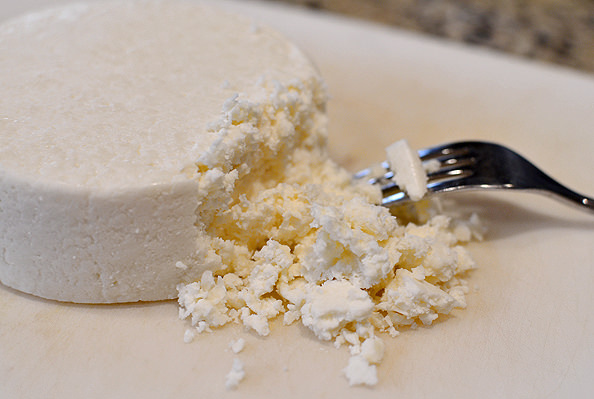 Cotija is a sharp, dry, and crumbly Mexican cheese. If you can’t find it, or don’t like super strong cheese, I’d sub in feta or even shredded Monterey Jack. Sprinkle the cheese on top then add a layer of fresh, chopped tomato. Chop up some fresh veggies and pop open a bag of tortilla chips, then dig in! 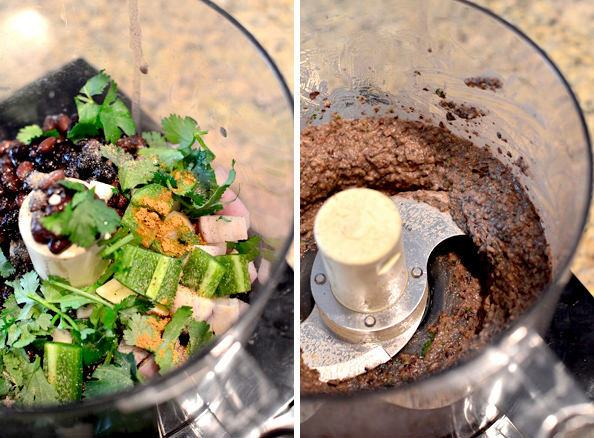 Combine ingredients for the black bean dip in a food processor the process until smooth, scraping down sides as needed. Taste and add more salt and pepper if necessary. 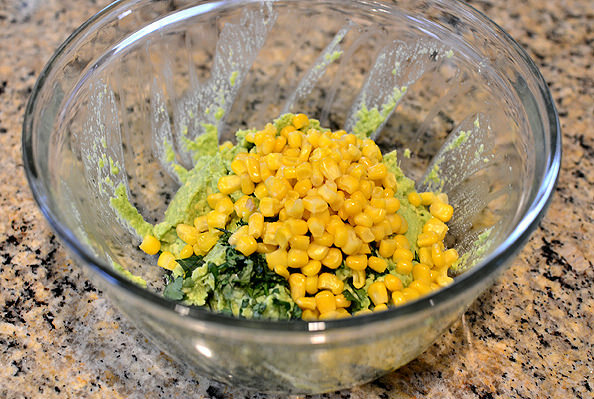 Smooth into the bottom of a 9" pie pan then place into the refrigerator while making Sweet Corn Guacamole. 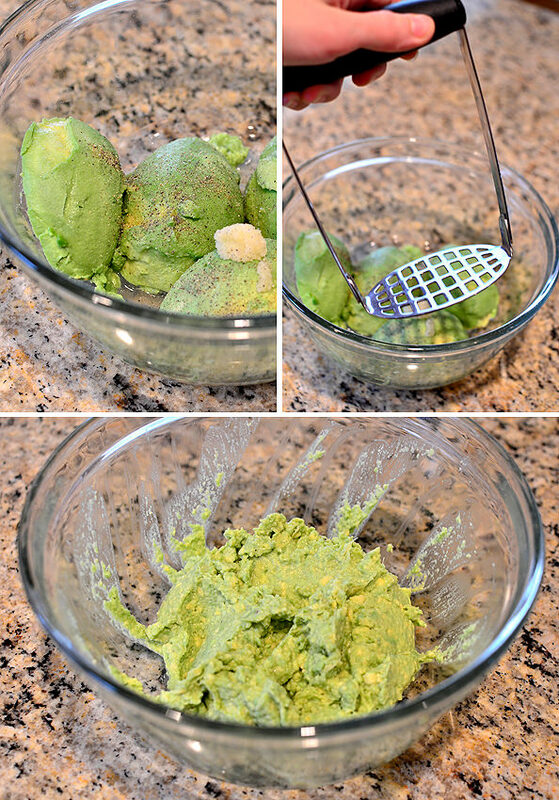 Add avocados, lime juice, garlic, salt, and pepper to a large bowl then mash until smooth. Taste and add more salt and pepper if necessary. 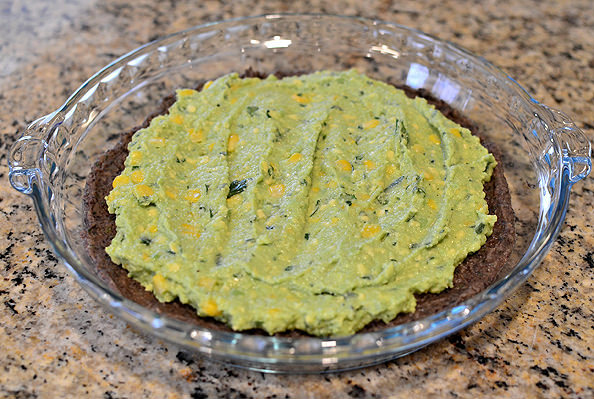 Fold in thawed sweet corn and cilantro then smooth on top of the black bean dip. 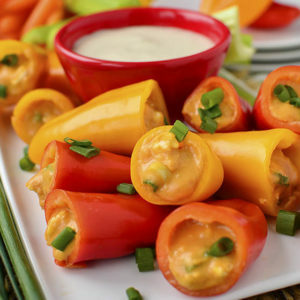 Sprinkle on chopped tomatoes and crumbled Cotija cheese then serve with tortilla chips and crudite. 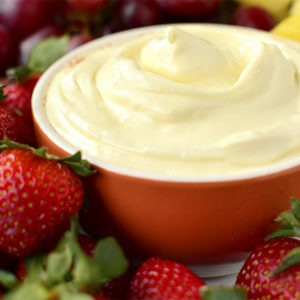 This dip will totally stand out from it’s heavier, creamy-dip cousins. That is to say, you can eat 1/4 of it and not feel like crap! Not that I would know… Enjoy! Mexican is bliss. 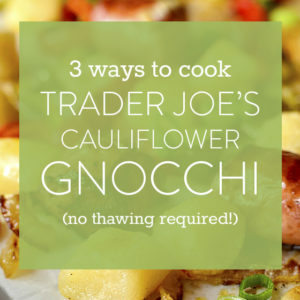 This recipe looks like a great staple to have around. Thank you for posting and for the great pictures as always. This looks fantastic. Love that it’s full of flavor but still healthy. My kind of food! This looks awesome! 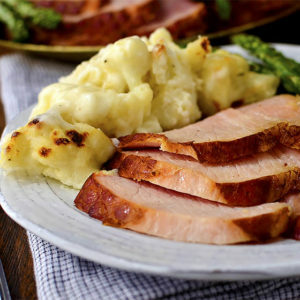 I love the layers…anything that has multiple flavours stacked on top of each other makes my taste buds happyhappyhappy! 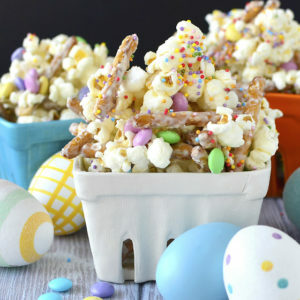 Plus, adding the corn into this is genius! yumm, that looks delicious! I love the idea of putting corn in the guacamole. Love the addition of cojita!! I could make a MEAL out of this dip. To die for. This looks amazing! And…that baby of yours, holy cuteness!! I love healthy recipes with bold flavor! 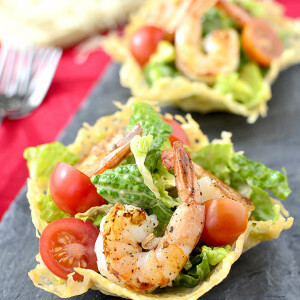 I am realizing for our super bowl party I will be using almost all of your recipes! I am going to try this one out tonight! Great picture of Lincoln!! His eyes are beautiful! Yay for a vegetarian recipe that’s easily made vegan! Virtual high-five! Yummy dip, yes – but look at that gorgeous Lincoln!!! This is awesome!! I LOVE mexican dip, but just learned that I’m lactose intolerant so no more sour cream or greek yogurt for me. Thankfully I can still do cheese, so this is perfect! Lincoln is so cute! This dip looks great, I am going to try this. I bet that guac is good!! Reminds me of when you get a Chipotle burrito bowl and the corn salsa mixes with the guac…love that!!! I don’t think a baby could ever be cuter than your little boy! I don’t know how you don’t just gobble him up everyday! 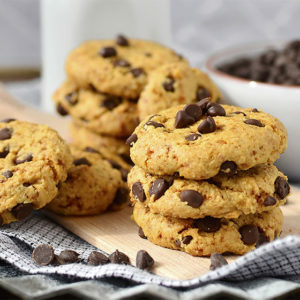 Yum!!!!!!! All my favorites in one! You are so creative!! 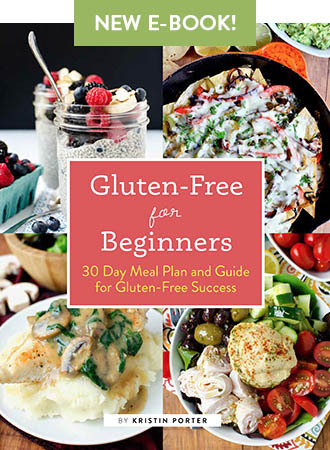 This looks amazing – totally pinning it! This is such a colorful dish, so pretty! 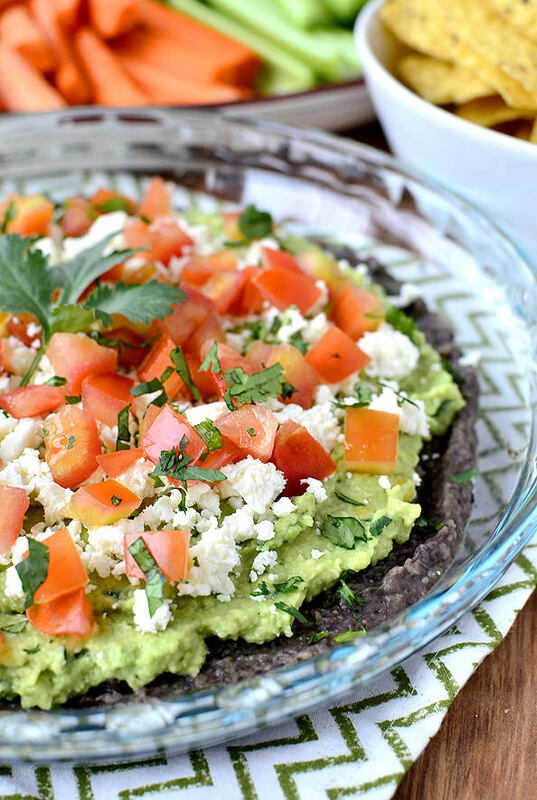 Sometimes I pick up the layered bean dips at Trader Joes but this looks so easy to make and so fresh and tasty. That looks amazing! 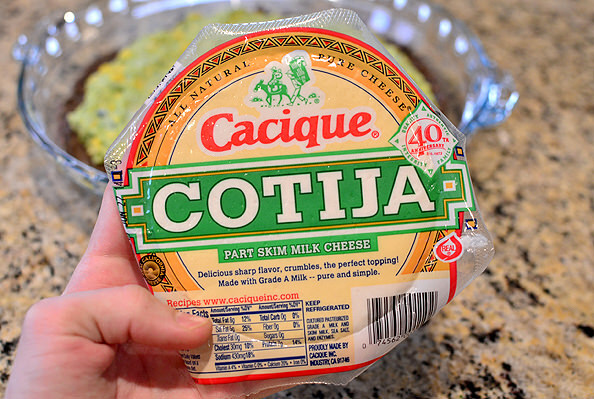 I have some cotija cheese for a warm corn dip that I am bringing to a family party, I am definitely making this with the leftover cheese! What an adorable picture of your baby boy! 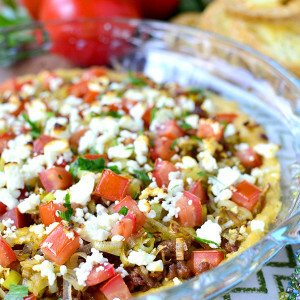 I love that this dip has all the flavors of my favorite Mexican dishes, but is put together in a totally different way. Plus it’s healthier…what’s not to love!? I don’t know what I like more, this crave-worthy dip or Lincoln’s precious little smile. My heavens, he is the cutest little thing!! Sweet picture of your husband and son. What’s your trick for picking out good avacados? And, how long do they stay “good”? Great question! 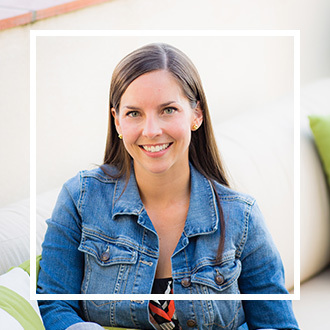 I look for avocados that are dark green in color and give a little when you push in with your thumb. They’ll keep on the counter anywhere from 3-5 days, in my experience. I’ll try and post a picture of a ripe/un-ripe avocado in a future post! This looks amazing!!! Definitely going to have to make it ASAP. Baby Lincoln is just the cutest! I can’t even handle it. Ooookay. I need this in my life. Like, now. This looks fantastic! And so simple! Will definitely be making this for the big game. 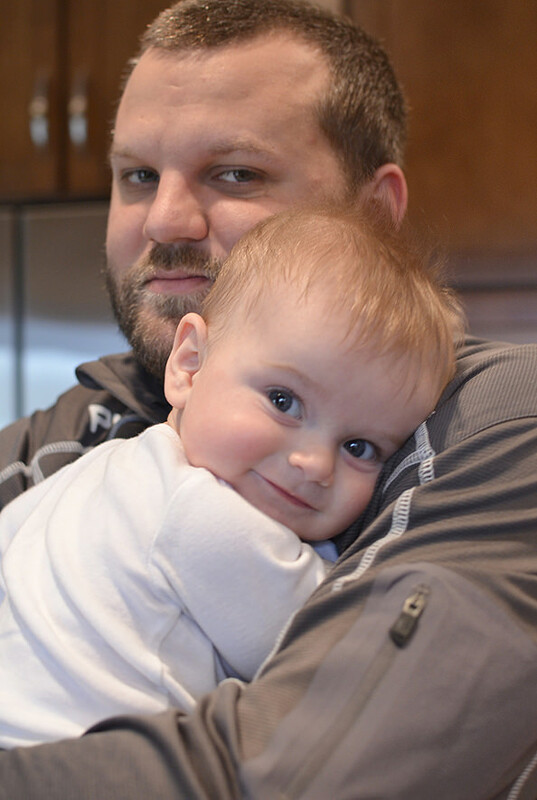 And oh my gosh, Lincoln just could not be cuter. You are blessed! Lincoln is soooooo adorable! He’s getting so big. Keep sharing pictures please! That recipe would be perfect for a Super Bowl party. Looks amazing and I love everything with avocados. And I just can’t get enough Lincoln pictures. He is too adorable! AAHHHHHH Lincoln is so cute!!!! And Lincoln looks like the most gorgeous kid ever. 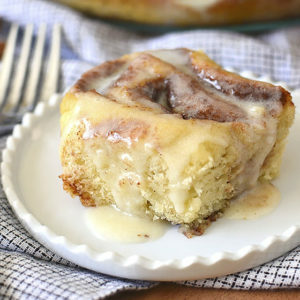 Ooo, this looks totally yum. It would be easy to use some cashew cheese, too. This looks fantastic! And your little guy looks so big– and so much like your husband! 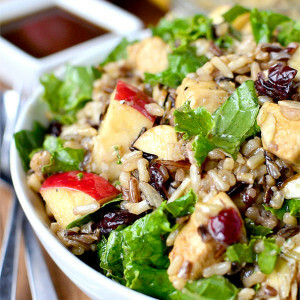 This is perfect for the superbowl and healthy to boot, lovin’ it! 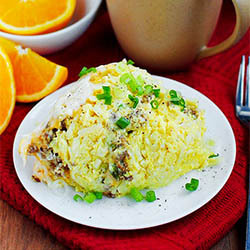 I just made this for my husband and I – we devoured it in about 5 minutes flat! Just so delicious and fresh. Will definitely be adding this to the rotation! This is sweet. The last picture makes me want to bite my computer screen.